Paul Warren - Brighton technical school, Victoria, Australia. Brighton technical school, Victoria, Australia. This photograph of Paul Warren, a student at Brighton Technical School, was taken at Wattle Park in 1974 by a photographer from “The Age” newspaper. Paul was competing in the Technical Schools Sports Association’s Cross Country Championship, and won the event in 1974 and 1975. ​“Bob McGuinness was our PE teacher who ran the School’s cross country and athletics teams at the time. Our athletics team won the top level of the championships in both years 1974/1975, helped by an amazing athlete Terry Krause, who won 7 gold medals. I won the 800 meters and the 1500 metres in both years, but Terry cleaned up all the rest. ​They were really two amazing years for Brighton Technical School’s sporting history. I give full credit to Bob, he was an amazing teacher and achieved so much with the kids at the highest level. My father took film footage super 8 at the athletics but I cannot find them, also in 1974 the School went on a trip to Alice Springs, and I took film of that trip as well, unfortunately, I am unable to find them yet. Technical Schools Sports Association Medals. 1975. Under 15, Cross Country Championship medal won by Paul Warren in 1975. 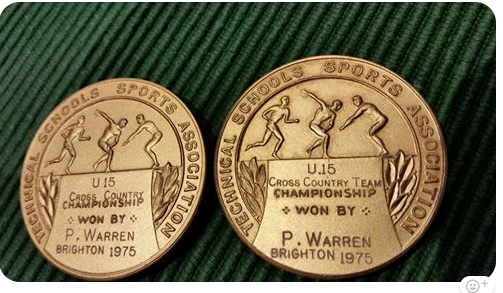 Under 15, Cross Country Championship Team medal won by Paul Warren in 1975.